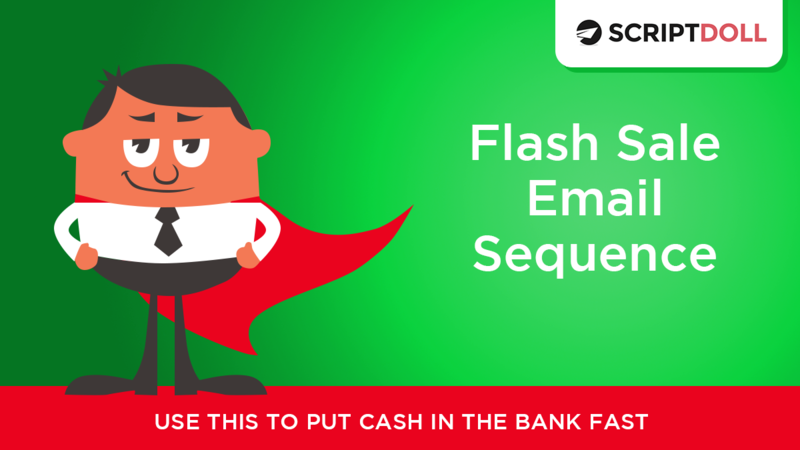 This Flash Sale Email Sequence is a 5-email sequence goes out over 4 days and it is designed to get you sales fast! It’s great for both physical or digital products so you can sell whatever you want or need to get out of your inventory. If you have a sales page up, use it. If you don’t you can send them straight to your cart, especially if your cart page has a list of features & benefits, your guarantee, and a few testimonials on it. You can use our Checkout/Cart Trust Builder Sales Page for this. The best timing to use it is over a Thurs, Fri, Sat, Sun. Or, if it is Black Friday, go for Black Fri, Sat, Sun, & Cyber Mon. This sequence can be run about every 60 days (yes, even to the same people – just take them off the list if they buy). If you don’t have ScriptDoll yet, grab it here for $1! Monica: Hi there, my favorite people. Yes, you. Because you’re watching this video, that means that you want to grow your business and that is so awesome. I have just the tool for you. It is our brand new flash sale email sequence. It is right here in your email sequences, in ScriptDoll. It’s awesome because you can use this five-part sequence to generate cash fast. [00:00:30] I wanted to release it to you a little bit early because, well, it’s Black Friday this week. You can grab one of your product profiles and plug it into this script and have this sequence ready to go over Black Friday this week, you guys. Normally, I recommend a four-day sequence go over Thursday, Friday, Saturday, Sunday, but this one, because of Black Friday, I am recommending for Friday, Saturday, Sunday, Monday to get the Cyber Monday people in there. Since you already have a product profile in ScriptDoll, this is super easy. [00:01:00] Now, if you’re listening to this and it’s no longer Black Friday, then it’s still a cash cow. This sequence makes a ton of money because it gives your email list a very special discount. You can also take this sequence and run it over, and over, and over again. About every 60 days, I would say. You don’t want to burn them out on it, but you definitely want to give people who have not bought the opportunity to buy at this very special price. [00:01:30] Jump in, grab this script, get to using it, and have a fantastic Thanksgiving!